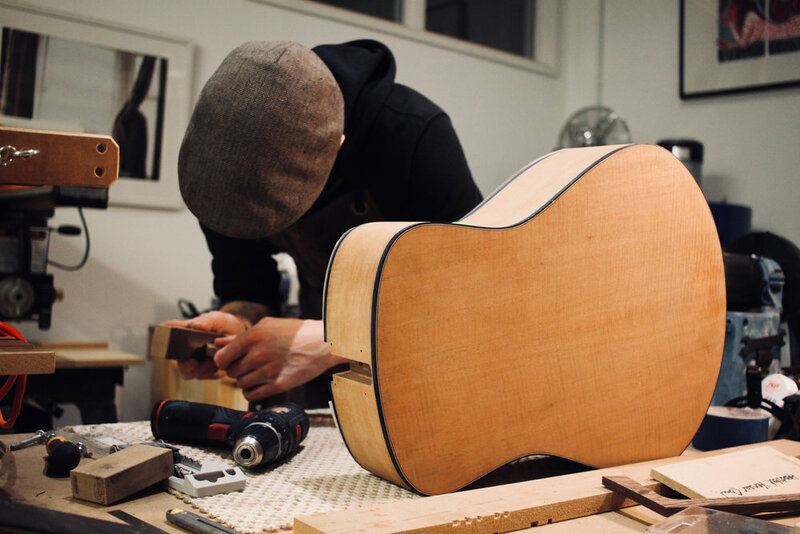 Welcome to the newest instalment of weekly content here at Tom Sands Guitars! A lot of progress is made every week, and here you can find a written account of what has been happening to get your regular of dose inspiration from your favourite workshop. Currently there are two guitars being brought to completion of a batch of six in progress. One of these is going out to the Golden Era Guitar in Singapore, (to see a build thread, click here) made of some gorgeous Honduran Mahogany / Swiss “Moon” Spruce, and the other is a Black Limba / Redwood Signature Model S for Will McNicol. Last week saw the beginning of the neck carving process. The wenge neck for the Honduran Mahogany Model S was first up on the bench, documented closely by our instagram story updates tackling the tricky carve real-time. We’re pleased to hear this was helpful to those who followed the videos! 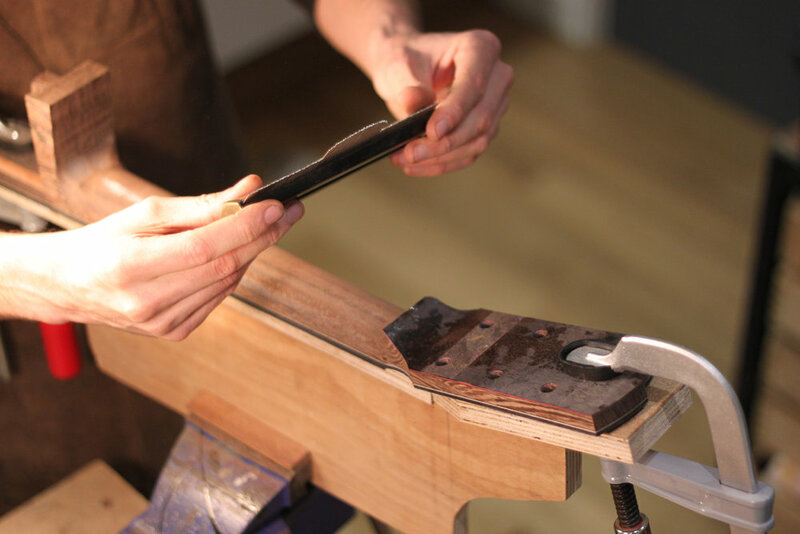 Throughout the week, the collection of clamps in the workshop were put to the test as the necks required a reliable support when being honed to perfection on the neck carving jig. We’re often asked which clamps we prefer, and we made a little video to offer some insight into our preferences. You can find the video on our Instagram and Facebook page, or watch it on YouTube here. Wenge is also on the menu for Will McNicol’s Black Limba Model S this week, as the neck carving comes to a completion. Wenge is a very hard wood, which can be daunting when carving a neck. If appropriately tough tools are not used, it is easy to spend hours honing the surface with increasingly blunt apparatus. To tackle this, we used a Auriou rasp, handmade in the Forge De Saint Juery in France. This was invaluable to this process as the hand-cut teeth on the metal ensures a more random pattern, resulting in a more fluid and even finish to the wood. Despite the challenge of carving the wenge, the result is all worth the time; the rich colour and pattern of this tone wood offers a striking aesthetic when juxtaposed with the Mahogany and Black Limba. Keep up with us on Facebook and Instagram for more visual content of our week! Thanks for reading - check back next week for your latest weekly roundup. Stay curious!